​Where do you feel pain when you are carrying an over packed backpack or shoulder bag? What muscles are screaming for relief? 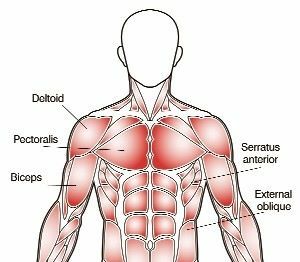 Muscles can be strained or pulled when they are stressed from overuse or trauma. Adhesions often occur when the covering over the muscles, the fascia, is involved. 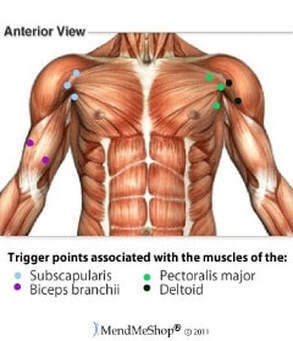 These adhesions are called "trigger points" and can prevent the muscles from working well. 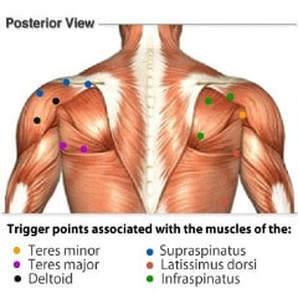 Trigger points lead to an increase in muscle stiffness and tenderness and a decrease in range-of-motion. In addition, the discomfort from trigger points can radiate from the adhesion. This is called referral pain and the most common pathways are shown in this image. Back to school and distressing back pain from carrying (often incorrectly) heavy backpacks. This is not uncommon among children; however, I am seeing it just as frequently in adults! According to the U.S. Consumer Product Safety Commission, backpack-related injuries sent more than 7,000 people to the emergency room in one year's time. The American Chiropractic Association's (ACA) Council on Occupational Health, reported on a study conducted in Italy. It was determined that the average child carries a backpack that would be the equivalent of a 39-pound burden for a 176-pound man, or a 29-pound load for a 132-pound woman. Of those children carrying heavy backpacks to school, 60 percent had experienced back pain as a result. Studies conducted in France show that the longer a child wears a backpack, the longer it takes for a curvature or deformity of the spine to correct itself. The results of these types of studies are especially important for middle school and high school aged students when time to run through the crowded hallways across a sprawling buildings forces them to abandon their lockers and to carry their books with them all day long. The heavy weight of the book bag can pull a child backward so that the child must compensate by leaning forward at their hips or arching their back. 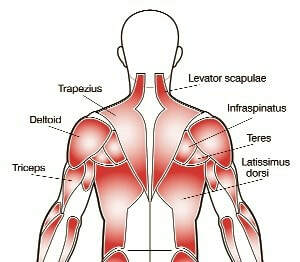 This might cause shoulder, neck and back pain by compressing their spine unnaturally. Backpacks with tight, thin straps can cut into the child’s soft tissue and shoulder muscles pinching the nerve and blood circulation which can result in numbness, tingling as well as weakness in the arms and hands. Girls and smaller children are especially at risk because the load share is heavier in proportion to their body weight. Now imagine if only ONE strap is used to look “fashionable” or for adults using a heavy shoulder bag!!! If you or your child experiences any pain or discomfort resulting from backpack use, we strongly urge you to visit the office before the pain of muscle spasms leads to scar tissue. Our gentler type of treatment for children and adults can minimize potential long term problems and in addition, teach you exercises designed to help children and adults alleviate symptoms, develop strong muscles, along with suggestion in good nutrition, posture and sleeping habits.